A written request for getting a job is called job application. It may be solicited or unsolicited. A job application is a person’s personal sales letter. So, it is said that a job application is like a sales letter. Today’s job market is a buyer’s market. There are many applications for a few positions. The employers call the people for interview on the basis of the application. A candidate’s education, experience, personality, training, all have no value if he cannot convince the employer. Briefly explain your qualifications and achievements. But describe only those qualifications and achievements that directly appeal to the self-interest of the employer. This make me a good candidate for this job. There are two types of job application. The word “solicited” means “requested“. A solicited job application is written in response to an advertisement from the employer. Such application has to compete with so many other applications. So, it must be prepared very carefully and effectively. An unsolicited job application is written when no advertisement was given for it. The applicant hears of a vacancy indirectly. Sometimes the applicant sends an application on the chance that there may be a vacancy. 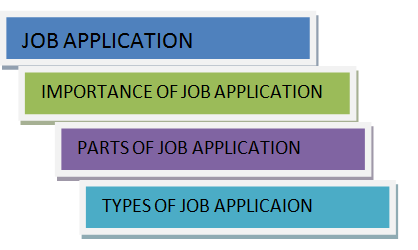 How to write job Application(Example). Write an application to chairman TEVTA Lahore for the post of an Accountant. Send also your C.V. In response to your advertisement in today’s Dawn, I submit my application for the post of Accountant. I did my D.Com in 2017. Currently, I am working as Accountant in a local firm. I enjoy my work here. But, being small, this firm provides few chances of advancement. During my job, i earned a diploma in computer from a local college where i attended evening classes. I have strong communication skills.I believe that i have achieved expertise and experience to serve a big organization like yours. My full particulars are shown on my C.V. Which has been enclosed. I request your honor to give me a chance to serve under your kind control. I shall do my best to satisfy my superiors with my work and conduct. What is Writing and Important principles of Writing Skills (Step by Step Guide). Barriers in Speaking Effectively & Best Techniques to Improve Speaking(step by step Guide). Four Different Types of Oral Presentation (Fully Explained). Kinds of Communication with Examples (Full Guide step by step).